The largest city and the capital of Slovenia, Ljubljana is an ideal place to visit if you want to avoid the crowds in Europe. It is under the radar of most travelers who want to enjoy Europe in August. Although the temperature can soar up into the 80s and 90s, the weather is perfect for those who want to bask in the sun, and enjoy its numerous sights and attractions without having to worry about rainfall. This beautiful city, named the European Green Capital 2016, is home to about 300,000 locals who have united to ensure that their city exemplifies green living. You can actually drink water from the tap, visit the city center with no motor traffic, and enjoy 80 hectares of maintained green spaces. The city’s attractions include Ljubljana Castle, National Museum of Contemporary History, Ljubljana Old Town, River Ljubljanica Kanal, Tivoli Park, Metelkova, Central Market and a number of picturesque bridges. The best thing about visiting this city is that almost everyone speaks English, so getting around and communicating with locals is a breeze. One of the most popular island destinations in the world, Bali, Indonesia, is also one of the best places to spend a vacation in August. It might be the peak season but the weather is generally cooler and you can enjoy the sea, sun, and sand without having to worry about rainfall. The “Island Of Gods” or the “Island of Thousands Temples” might be an island known for its beautiful beaches, but there are so many things you can enjoy in Bali including peaceful walks in villages located in the uplands, cooking classes, soothing massages and treatments, visits to temples, watersports, cultural immersions, and meeting people from all over the world! You haven’t been to Bali if you do not visit Tanah Lot Temple, Ubud Monkey Forest, Tegallalang Rice Terraces, Mount Batur and the Caldera Lake, Goa Gajah Elephant Cave, and the town of Ubud, where Julia Roberts’ filmed some scenes in the movie Eat, Pray, Love. The best thing about visiting Bali is that there are accommodation options to suit every budget! Haven’t been to Africa? You might want to start by visiting Zanzibar, Tanzania, in August. The Zanzibar archipelago is composed of small islands, and is a semi-autonomous part of Tanzania. It lies below the equator which means it gets really hot and humid, but the month of August is an ideal month to visit the archipelago because the average temperature is at its 70s, and the air is a little cooler, breezy, and dry with little rainfall expected. The archipelago is known to have the best beach location in Africa and even during the peak season, you will not encounter too many tourists. The city of Stone Town, its capital, will take your breath away with its amazing architecture dating back to the 19th century and reflects the influence of the Moors, Persians, Arabs, Europeans, and Indians to the city. It is not surprising that the city was included in the UNESCO’s World Heritage Sites in 2000. Aside from the StoneTown and its fantastic beaches, its attractions include the beautiful Prison Island, Mnarani Marine Turtles Conservation Pond, Mtoni Palace Ruins, Zanzibar Butterfly Centre, Palace Museum, Zanzibar Spices and Heritage Centre, The Old Fort, Mercury House (yes, the birthplace of Freddie Mercury), and Darajani Bazaar. 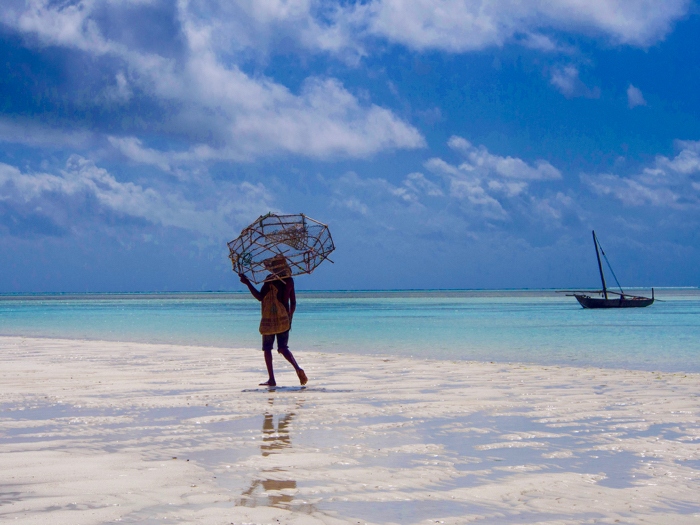 In our humble opinion, Zanzibar is one of the most underrated places in the world. Although August is a peak vacation month in Portugal, there is a little village about an hour and a half away from Lisbon called Comporta which boasts of a 13-mile long sandy beach, often overlooked by travelers who have their sights on the Algarve region. The village is nestled between a dense forest and the ocean, and is a favored destination of the stylish European crowd who avoid the usual crowded beach resorts during the peak season. It can be pretty busy during the weekends, but you do not have to share a spot on the beach with anyone else. This is the ideal getaway vacation spot where the storks probably outnumber humans! There are a number of restaurants where you can savor the best Portuguese cuisine, and enjoy some drinks at when the sun sets. Comporta is the ideal off the beaten path, beautiful vacation spot, perfect for those who want to get away from it all. There are a number of things that will lure you to Vancouver, Canada, during the month of August. First of all, the weather is warm and comfortable, perfect for you to explore its attractions and festivals. Although this is the peak season, there is always something to do and enjoy, so you won’t be surrounded by crowds. If you love festivities, the month of August is when the city celebrates the Abbotsford Air Show, Vancouver Chinatown Festival, Celebration of Light, Out on Screen Queer Film and Video Festival and the Bard on the Beach Shakespeare Festival. Its attractions include Museum of Anthropology, Granville Island, Bloedel Conservatory, Stanley Park, Vancouver Lookout, Gastown neighborhood, Lions Gate Bridge, Science World, and a number of beaches. So why choose Vancouver? It is a charming traveler-friendly city with so much to offer!